Ontario Liberal Leader Kathleen Wynne is photographed at the Globe and Mail offices during an interview. In her five years as Ontario’s Premier, the one thing Kathleen Wynne truly regrets is her government’s handling of electricity prices. The Liberal Leader, whose election campaign over the past week has turned to a strategy of “sorry, not sorry” – that is, she’s genuinely sorry people don’t like her but not sorry about her accomplishments – admitted to failings on the file during a meeting with The Globe and Mail’s editorial board on Tuesday. “I probably reacted later than I should have, I probably should have acted more quickly, but we were looking for ways to reduce prices that were responsible. 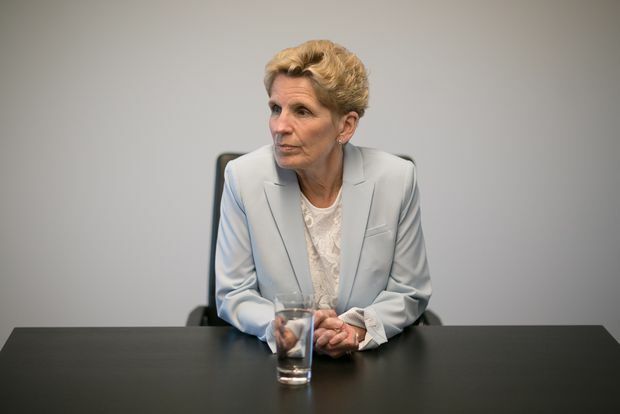 It took some time, it meant that people were pretty angry, and rightly so, about how quickly their electricity prices had gone up,” Ms. Wynne said. Acknowledging the Liberals’ third place in the polls, Ms. Wynne said she will have time after the provincial election on June 7 to reflect on what she could have done differently since she took over the Premier’s office in 2013. “I’ll have lots of time to ask those questions of myself once we get through the election. I’m very focused on taking our plan to the people of the province, 20/20 hindsight is wonderful and there will be lots of people who will be analyzing what did or didn’t happen,” she said. Ms. Wynne is deeply unpopular and facing a difficult re-election bid. Her party has been in power for 15 years, the first two-thirds of that time under Dalton McGuinty. The Liberal Leader dismissed the widely argued view that she is struggling in a campaign where most voters have said they want change, under either Progressive Conservative Leader Doug Ford or New Democratic Leader Andrea Horwath. While her two rivals have been jockeying for the lead in most polls, Ms. Wynne was realistic about her chances but said she still maintains hope that she can win. “It’s tempting to say change for the sake of change is necessary, but I really do think we have to carefully think about change to what? I do think that going into this election there was a sense that ‘It’ll be okay, whatever the change is.’ But I don’t believe people feel that any more,” she said. According to Ms. Wynne, the election now has a “volatile dynamic” as voters have second thoughts about Mr. Ford and reflect on the more intense scrutiny surrounding Ms. Horwath and her party’s candidates. One of the leading sources of discontent among Ontario voters has been a rapid rise in the province’s hydro prices. Off-peak electricity rates rose by 149 per cent between 2006 and 2017, driven by a surge of investment in new generating capacity and transmission lines. The hikes coincided with the closure of Ontario’s coal-fired power plants and Ms. Wynne’s controversial decision to privatize transmission utility Hydro One. Facing daily anger over hydro bills, the Liberals announced in March, 2017, that they would cut rates by 25 per cent. The government borrowed billions of dollars to lower bills through the end of the decade. Hydro rates will then rise over the next two or three decades to pay for the borrowing. Mr. Ford and Ms. Horwath have both sought to capitalize on the public’s anger with hydro bills during the past three weeks of campaigning. The Tory Leader has promised to fire Hydro One’s chief executive and reduce bills by 12 per cent, largely by shifting costs to taxpayers. Ms. Horwath has said she would cut hydro bills by 30 per cent and buy back Hydro One’s shares to make the utility a government-owned entity again.